Come relax and enjoy this private setting just moments away from shopping, restaurants and attractions, Manchester VT. The ground floor level of this cottage has a fully furnished one bedroom Mother-in-Law apartment vacation rental, two night minimum stay, $135.00 per night, with discounts of 20% for 7 + night stays and 40% for 28 + night stays. The first floor private entry foyer is very handy for storing personal belongings inside and has a small office with a photocopier, FAX, paper shredder, land-line phone for unlimited long distance U.S.A. & Canada calls, and WiFi for your laptop. In winter, bring your skis poles and boots inside the foyer to the ski & boot racks. From the foyer, enter the apartment on your left, through to the combined open-concept living room and dining areas. There is a small reading area off the living room, next to the cozy Franklin propane stove, very toasty if chilly. The dining area seats 4 and has floor-to-ceiling glass windows for your seasonal view, including Mount Equinox, the tallest mountain in southern Vermont, due west of the apartment (sunsets), and step out onto the gravel patio with seating (seasonally). Full kitchen with microwave oven, refrigerator/freezer, electric cooking stove and oven, coffee pot with Auto Shut OFF, toaster, toaster oven and dishwasher. The bedroom has one king-size bed, a dressing area, and bathroom with full shower and tub and hair-dryer. For your convenience, the apartment laundry room is just off the dressing area in a separate utility room. Washer, dryer, steam iron, ironing board, and portable fan for the 10 really hot days Vermont gets per year. This property is nestled on 30 acres inside the Green Mountain National Forest on the quiet west side of Bromley Mountain, less than 5 miles down from the summit and less than 3 miles east of the Manchester & Manchester Center villages, in northern Bennington, County, Vermont. A wide range of cuisine choices and pricing are in the area. Summer theatre in nearby Dorset, Weston, Bennington and museums such as Hildene, Southern Vermont Art Center (SVAC) and Robert Frost's home. Handy Day Trip to Saratoga Springs for thoroughbred horse racing at the "SARATOGA" flat track or trotters at the Saratoga Racino Casino. Also, MassMoCA (Massachusetts Museum of Contemporary Art) in Adams, MA and The Norman Rockwell Museum in Stockbridge, MA and the terrific Shelburne Museum in Shelburne, VT. All are nice day trips. This is a non-smoking and pet-free property. Thank you. We can recommend a kennel if needed. Remember, this is a totally furnished apartment, NOT just a hotel room. Longer term or seasonal rentals may be arranged. For example: summer rental, fall foliage rental, ski rental or "I'm having a home built in the area" type rental. Feel free to ask. For skiers, just about the only way you can get closer to the mountains is to sleep in the ski lodge locker room. The apartment is on Bromley Mountain. Nearby VT Ski & Hiking Mountains Include: Bromley Stratton Magic Okemo Killington Pico Mount Snow all within the 10 to 60 minute time range from BUCKRUN ! ! Ethan Allen and his young (green) mountain boys would meet in the village, across from The Equinox Resort, before it was a * * * * * resort, back when it served the public, before the Republic. SEASONAL: When the leaves have been blown off the trees in the forest, one can see the tallest mountain in southern Vermont, due west of the apartment, Mount Equinox. Ahhhh, SunSets ! Bring wine. Franklin Propane Fireplace Stove and Each Room also has Individual Electrical Thermostat. Bring your laptop, we have WiFi code for your use. There is a "charging station" for your electric gizmos, bring your connecting wire to recharge. View due west, from left to right, Little Equinox Mountain, Mount Equinox, Mother Myrick Mountain, Bear Mountain and Mount Aeolus. Pretty. Cupboards contain glasses, dishes, utensils. Dinner plates, salad plates, mugs, cups saucers, knives, forks & spoons. Patio off living/dining area, seats 2 in Adirondack chairs. My wife and I stayed at Jim’s place for a ski weekend and had a great experience. The apartment is in an ideal location - between Manchester and Stratton. Jim was a wonderful host who had the apartment prepared for us upon arrival. We loved the propane stove, views from the backyard and chocolates left on our pillows. 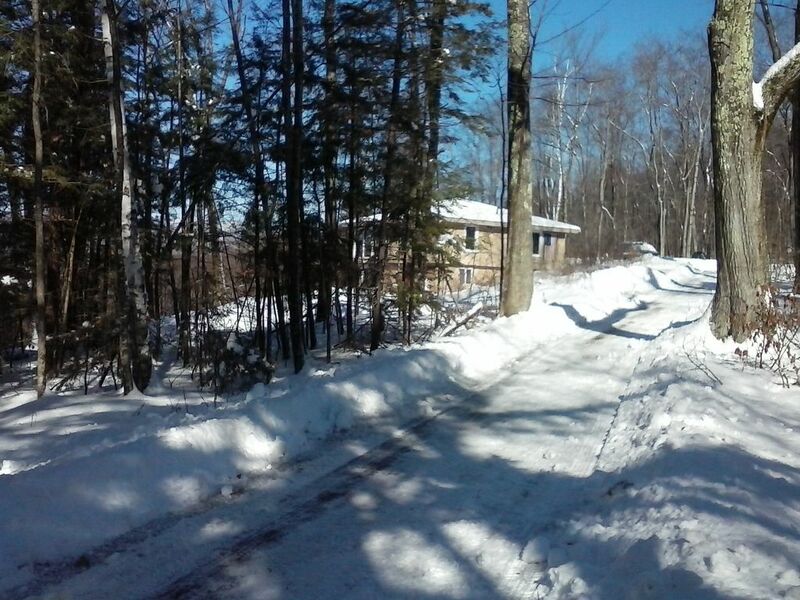 Our stay was during a major snowstorm and Jim made sure to have the driveway plowed and the walkway shoveled. Additionally, we arrived early and he allowed for an early check-in. We would definitely recommend the apartment and stay there again. Excellent place with a superior host! Stayed here with my boyfriend for a last minute ski weekend. The owner, Jim, is extremely attentive, generous, and accommodating. The location is very ideal - just a few minutes driving to all shopping and dining attractions in Manchester, as well as to Bromley Mountain. Very comfortable apartment that met all of our needs, and the view from the dining area is beautiful! We are hoping to return for another stay as soon as we can! Warm, cozy home in the woods with an amazing view. As advertised! Jim was very responsive to our questions about the home and surrounding area. The house was very cozy, with a fire going, the lights dimmed and classical music playing upon our arrival. You can tell that Jim spent a lot of tike anticipating needs and questions and made it easy for us to quickly make his home our home. Thoughtful touches like milk in the refrigerator and tea/coffee available made our stay extra special. My husband and I loved this place. It was secluded, yet close to Manchester and Dorset. Jim was very thoughtful and made us feel very welcome. The bed was comfortable, the shower was great. My favorite part was sitting in the dining area in the morning looking out the glass walls at Bromley mountain and watching the birds eat the last of the wildflower seeds. We look forward to returning in the future. Very clean, cute apartment in a convienient location. It was not the best choice for my husband and I. Check out these web-sites BEFORE arriving ! ! ! Historic Manchester Vermont, . . . . .
is an actual living post card . . .